ABUJA— For the first time since the 2015 general elections, national leader of ruling All Progressives Congress, APC, Asiwaju Bola Tinubu, has met with the party’s national chairman, Chief John Odigie-Oyegun, in a move widely seen as the beginning of his new task as presidential negotiator into the crises bedeviling the party. 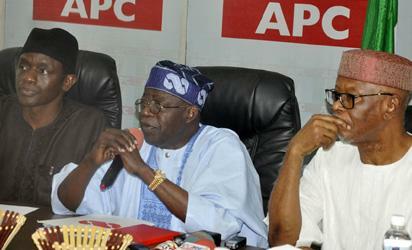 APC—From left: Party National Secretary, Mai Mala Buni; National Leader, Asiwaju Bola Tinubu and National Chairman, All Progressives Congress, APC, John Odigie Oyegun, during a consultative meeting among NWC members of the party at the party secretariat, Abuja, yesterday. Photo: Gbemiga Olamikan. The APC leader spoke on a day Peoples Democratic Party, PDP, said the advice he gave Nigeria’s ex-Presidents to quit politics and join the retirees’ club should also be heeded by President Muhammadu Buhari in the interest of the nation. Tinubu, who was recently appointed by President Buhari to reconcile warring parties within the party, said he was visiting the national secretariat as part of consultations on how to carry out his assignment. He said: “Since we won the elections, the expectations were very high and the goodwill was extremely high. But where are we today? Though he declined comments on whether he was among the foremost aggrieved stakeholders of the party, having last year called for the sack of Chief Odigie-Oyegun, Tinubu said challenges faced by the government and the President were enormous. He said: “It is only because people are not paying attention to the various statistics that are available. We have never governed before, but we won the confidence of Nigerians to govern. Welcoming Tinubu to the APC national secretariat, national chairman of the party, Chief John Odigie-Oyegun, said the assignment given to him (Tinubu) by the President was significant to heal the wounds where necessary. “Your visit is very significant, in view of your Presidential assignment which I will describe as a peace ambassador, to heal wounds where the party has wounds and bring everybody together behind one single objective, which is the APC being in good condition to be a fighting political force, such that in 2019, the election will become virtually a runaway victory for the party. “There is no question at all that we have major issues with the National Assembly, major issues in Kano, Kogi, Benue states with the current challenges that we are facing. Meanwhile, Peoples Democratic Party, PDP, has said the advice by APC national leader, Tinubu, that Nigeria’s ex-Presidents should quit politics and join the retirees’ club should be heeded by President Buhari in the interest of the nation. The party said Tinubu’s position completely vindicated the positions of former Presidents, including Olusegun Obasanjo and Ibrahim Babangida, PDP as well as majority of Nigerians, who believe President Buhari should not seek re-election in 2019, having failed woefully in governance and nation building. The PDP, in a statement by its National Publicity Secretary, Kola Ologbondiyan, yesterday, said the former Lagos State governor had invariably weighed Buhari and found him unfit to remain in office beyond 2019. “Even Tinubu knows that President Buhari, for obvious reasons, is the most qualified of all our elder statesmen to join the retiree’s club and save the nation the agony of more years of misrule characterized by untold economic hardship, heavy bloodletting and general indignation. The post 2019: APC has lost goodwill since 2015 -Tinubu appeared first on Vanguard News.